Have you ever heard of bibliotherapy? It's where you contact someone who is very well read and tell them of a malady you have. It may be physical like a stomach ache or it may be psychological like malaise. The bibliotherapist asks you more questions about your reading diet and then prescribes a book (usually fiction) to address your issue. 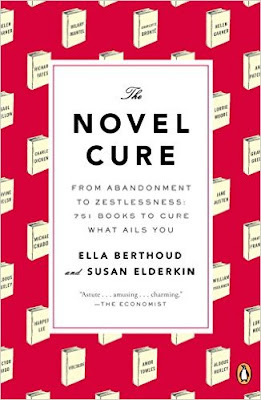 Ella Berthoud and Susan Elderkin are bibliotherapists who have prescribed cures for everything from being a dictator (The Successor) to egg on your tie (Restoration.) They operate out of the School of Life in London. This really is more of a reference book than one that you would necessarily want to read straight through. And I haven't tried any of the suggestions yet, so I don't know how apt they are. One warning: the plot summaries are quite thorough and give away spoilers. But the books were often ones I had never even heard of before, so I enjoyed the broader exposure. This book inspired me to do a little bibliotherapy of my own. 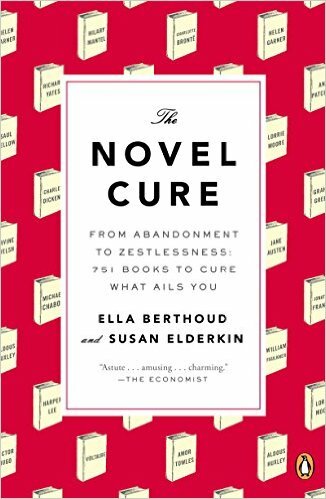 So, from now on, instead of pairing my book with a drink, I will be "distilling" books into ailments and cures. The Novel Cure is the cure for a little bit of everything. If there's something missing, maybe some of my future reads will help fill in the gaps.